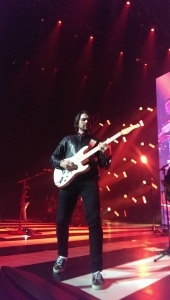 Hundreds of adoring fans spent an unforgettable Saturday evening at the Rosemont Theatre being serenaded by megastar Juanes, during his Loco De Amor Tour 2015. “Chicago, you are always incredible to me,” said Juanes. “You are truly the best city in the world. Thank you for always welcoming us with open arms.” The venue reached pandemonium as Juanes belted tunes from, Es Por Ti, A Dios Le Pido, La Luz, Loco De Amor, La Camisa Negra, even crooning his own rendition of Bob Marley’s hit, One Love to a Joe Arroyo classic, Rebelion.